The larger fraction of natural radiation exposure to public comes from radon, a radioactive gas with a half-life of 3.8 days. The radon, emanating from rocks, soils, etc., tends to concentrate in enclosed spaces such as underground mines and dwellings and thereby significant contribution to human exposure. 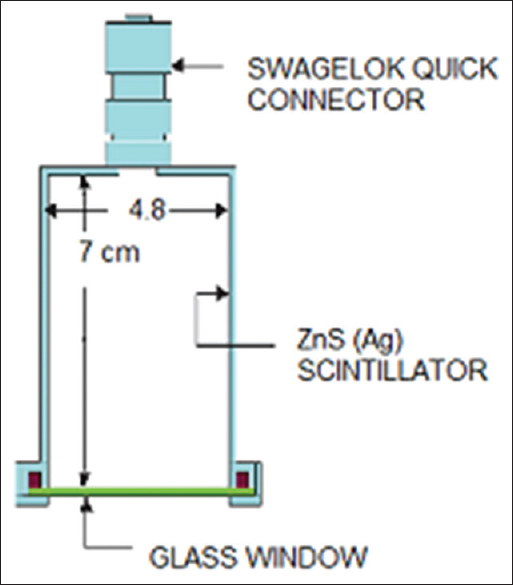 Radon is soluble in water and the second leading cause of lung cancer as per various reports. Chavara-Neendakara at Kollam District in Kerala has got the second position in the ranking of high background radiation areas (HBRAs) in the world and also a significant position in the case of number of cancer patients. In the recent years, studies on the HBARs in the world have been of prime importance for risk estimation due to long-term low level whole-body exposure to the public. Hence, the objective of the study is radiological protection of the population in the selected region and to find the excess lifetime cancer risk (ELCR). Sampling stations were identified in selected locations along south-west coast of Kerala, namely, Kovalam (S1), Varkala (S2), Neendakara (S3), Chavara (S4), Alappuzha (S5), Cherai (S6), Chavakkad (S7), Padinjarekkara (S8), Kappad (S9), and Kannur (S10) on the basis of radiation intensity observed using scintillometer UR 705. Samples were collected and treated following standard procedure. About 1 l of water was collected from each sampling station in airtight bottles. The bottles were filled completely to minimize loss of 222Rn during sample collection. 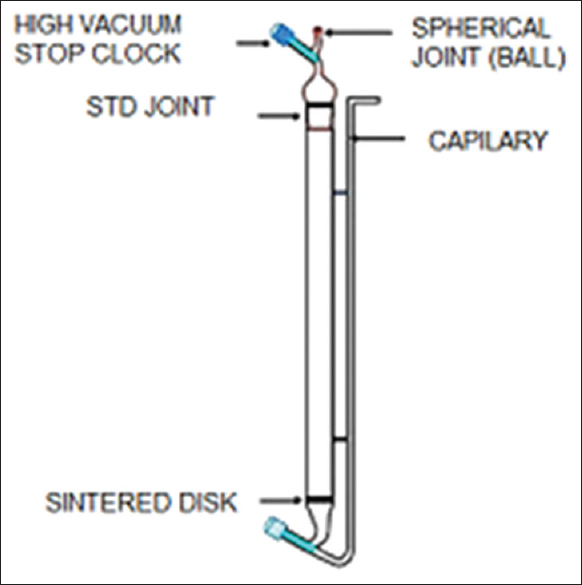 The samples were brought to the laboratory with minimum delay and were analyzed immediately. In each region, three sets of samples and in total 30 samples were collected during each season for the analysis. where, D is counts above background, V is volume of water, E is efficiency of the scintillation cell (75%), λ is decay constant for radon (2.098 × 10−6/s), T is counting delay after the sampling (in seconds), and t is counting duration (in seconds). Where, Cr is concentration of the radionuclide in ingested drinking water (Bq/l), If is annual intake of drinking water containing the radionuclide (l/y). The dissolved radon is also a source for the indoor radon and its contribution will depend on the usage rate, the volume of the indoor environment, and the air exchange rate. It was estimated that 1 Bq/m of 222Rn in air with an equilibrium factor of 0.4 and an occupation factor of 0.8 results in an effective dose of 28 μSv/y to the lungs. Considering the transfer factor of 222Rn released from water to air to be 1 × 10−4. Whole-body dose can be obtained by adding the doses to the lungs and stomach. Potential carcinogenic effects are characterized by estimating the probability of cancer incidence in a population of individuals for a specific lifetime from projected intakes and chemical-specific dose-response data. The additional or extra risk of developing cancer due to exposure to a toxic substance incurred over the lifetime of an individual. ELCR is calculated following the equation. Where, AEDE is the annual effective dose equivalent or whole-body dose (μSv/y), DL is the duration of life (70 years), and RF is risk factor (0.05 S/v). The concentration of radon in water samples collected along coastal parts of Kerala during premonsoon, monsoon, and postmonsoon seasons was measured by well-established emanometry method. The results of the study are tabulated in [Table 1], [Table 2], [Table 3]. Comparatively, higher concentration of radon was found in the samples collected from Varkala and Chavara regions and lower concentration was found in samples collected from the Chavakkad region. The results indicate that the radionuclide concentrations of the soil near to the sampling stations have influenced the activity of water samples. The higher activity observed in the samples collected from Varkala region may be attributed to the presence of colored granite in soil. The presence of hot spring, which carries high amount of radium and its decay products to the surface, may also be influenced the concentration of activity in the region. Lal et al. (1989) have reported the presence of monazite in soil samples of Chavara region and this may be the reason for comparative higher concentration of radon in this region. 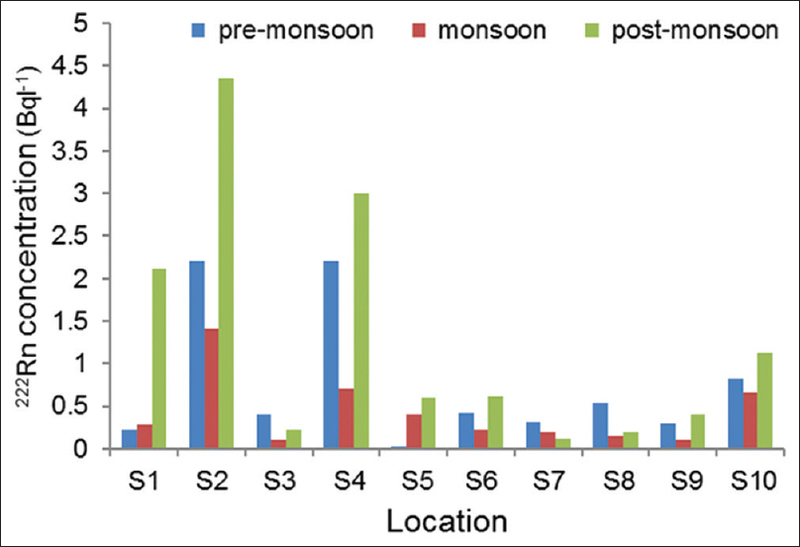 Deviation of radon concentration during premonsoon, monsoon, and postmonsoon is shown in [Figure 3]. 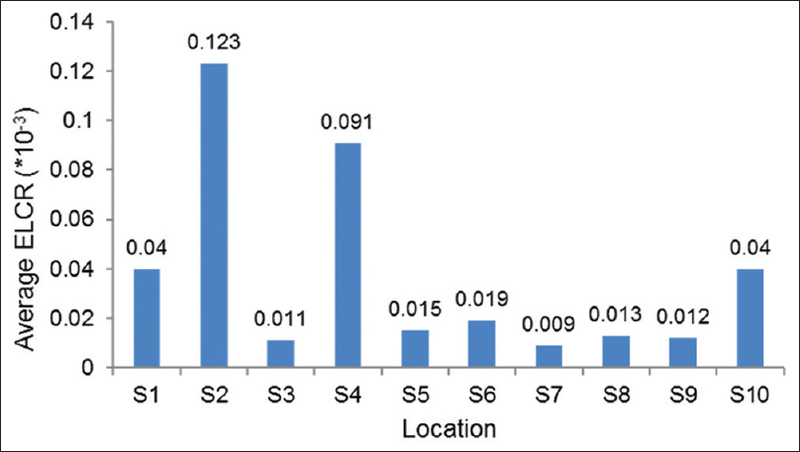 Variation of average value of ELCR parameter at different locations is shown in [Figure 4]. Comparatively higher value of radon concentration is found in all water samples collected during postmonsoon. This may be due to the higher solubility of radon in water at low temperatures. Postmonsoon is the winter season and the temperature is comparatively low in Kerala coast. In premonsoon, radon concentration was high in all the water samples compared to monsoon season; however, it was less compared to postmonsoon. This may be attributed to the reduced level of water column in the well during postmonsoon. The level of water column in the well is raised due to heavy rainfall during monsoon, which reduces radon concentration in the water. Geological and geochemical conditions such as temperature, wind, pressure, degree of rock weathering, the disequilibrium state of the uranium series inside the solid grain, and adsorption of radium in the rock grain and fracture surfaces and on the effective rock surface exposed to groundwater contact, etc., influence the quantity of radon in open well water. In premonsoon, degree of rock weathering is high due to high temperature about 40°C in Southern Kerala coast. Weathered rock pieces have larger surface area and may enhance the radon concentration when subjected to water. The presence of monazite, a thorium-rich mineral, may be another reason for the enhanced level of radon concentration in water. Larger deposition of monazite has seen at Kerala coast during postmonsoon. The enhanced level of radon concentration in water in turn leads to radon exposure to the human beings. The whole-body doses (effective dose) during premonsoon, monsoon, and postmonsoon were found to vary in the range of 0.39–29.34 μSv/y, 1.33–18.76 μSv/y, and 1.59–57.90 μSv/y, respectively. The results were compared with the values recommended by the WHO and EU council. It is found that the values from the present study were well within the permissible limit. The average value of ELCR at Varkala and Chavara is comparable with the world average value of ELCR (0.29 × 10−3). According to Kerala state cancer profile, Kollam and Trivandrum Districts have the higher number of cancer patients which shows the significance of the area. According to Cancer and Allied Ailments Research Foundation (Kerala), Kerala has roughly 35,000 new cancer cases every year. There are 913 male and 974 female cancer patients per million in Kerala. A total of 100,000 cancer patients are in prevalence annually in the state. Among the above, 70%–90% of cancers are due to the environmental effects. Higher values of ELCR in the present study area may be involved in the above percentage of occurrence of cancer. Recently, Forster et al. reported that the natural radioactivity in the study areas was associated with mitochondrial DNA mutations in the residents. Nair et al. reported that, in site-specific analysis, no cancer site was significantly related to cumulative radiation dose. Leukemia was not significantly related to HBRA, either. Although the statistical power of the study might not be adequate due to the low dose and their cancer incidence study, together with previously reported cancer mortality studies in the HBRA of Yangjiang, China, suggests it is unlikely that estimates of risk at low doses are substantially greater than currently believed. It is concluded that harmful radiation effects are posed to the public in the coastal parts of Kollam and Trivandrum Districts and the activity of radon in drinking water may be one of the reasons for such effects. Except Kollam and Trivandrum, other areas not possess significant cancer incidence. The seasonal variation of radon concentration is less significant in most of the samples collected along the region. However, a slightly higher concentration observed during postmonsoon may be due to the low temperature leads to the increase in solubility and large deposition of monazite sand along the regions, especially Varkala, Chavara, and Kovalam. In premonsoon, quantity of radon is significant may be attributed to reduced water sources and prolonged period of the absence of rainfall. This, in turn, leads to lowering of water table that concentrates radium and radon. The reduced level of radon concentration during monsoon may be associated with the increased rainfall and high water level of the well. Local geology and geochemical effect may be the reason for the lower or higher concentration of radon in each sample. The observed values were well within the permissible limit recommended by the WHO and EU council and the water from the region can be safely consumed from the radiological protection point. There are no conflicts interests. World Health Organization. Guidelines for Drinking Water Quality, Radiological Aspects. 3rd ed., Vol. 1. Geneva: World Health Organization; 2004. p. 1-494. Rajesh BM, Chandrashekara MS, Nagaraja P, Paramesh L. Studies on radon concentration in aqueous samples at Mysore city, India. J Radiat Protec Environ 2012;35:9-13. Sainz C, Dinu A, Dicu T, Szacsvai K, Cosma C, Quindós LS, et al. Comparative risk assessment of residential radon exposures in two radon-prone areas, Stei (Romania) and Torrelodones (Spain). Sci Total Environ 2009;407:4452-60. Herbert L, editor. EML Procedure Manual. In: Volchok and Gail de Planque. 26th ed. New York: Environmental Monitoring Laboratory; 1983. D'cunha P, Narayana Y, Karunakara N, Yashodhara I, Kumara S. Concentration of 222Rn in drinking water along coastal Kerala and evaluation of ingestion doses. Radiat Protec Environ 2012;34:197-200. Shivakumara BC, Chandrashekara MS, Kavitha E, Paramesh L. Studies on 226Ra and 222Rn concentration in drinking water of Mandya region, Karnataka state. J Radiat Res Appl Sci 2014;7:491-8. Yu KN, Guan ZJ, Stokes MJ, Young EC. A preliminary study on the radon concentrations in water in Hong Kong and the associated health effects. Appl Radiat Isot 1994;45:809-10.
International Commission on Radiological Protection. Annals of ICRP 1990 Recommendations of the International Commission on Radiological Protection. Pergamon, UK: ICRP Publication; 1991. Soniya SR, Monica S, Vishnu Prasad AK, Jojo PJ. Heterogeneity of radioactivity in soil from Varkala, Kerala. Int J Pure Appl Phys 2017;13:209-14. Lal M, Choudhury RK, Joseph D, Bajpai HN, Tyer CS. Elemental analysis of selected Indian monazite ores by energy dispersive X-ray fluorescence/EDXRF/spectroscopy. J Radioanal Nucl Chem Lett 1989;137:127-33. EU (European Union Commission). Recommendation on the protection of the public against exposure to radon in drinking water supplies. Official J Eur Communities (Brussels Belgium) 2001;344:85-8. Forster L, Forster P, Lutz-Bonengel S, Willkomm H, Brinkmann B. Natural radioactivity and human mitochondrial DNA mutations. Proc Natl Acad Sci U S A 2002;99:13950-4. Nair RR, Rajan B, Akiba S, Jayalekshmi P, Nair MK, Gangadharan P, et al. Background radiation and cancer incidence in Kerala, India-Karunagapally cohort study. Health Phys 2009;96:55-66.